What's a Timber Frame, and how's it built? 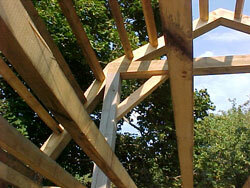 Timber framing is a post and beam construction that is one of the oldest in the world. For connections, they require joinery that fit together with glove-like precision. Mortise and tenon, dovetail, half lap, scarfs–even the joints carry the sound of a melodic history of strength. But these joints rely on the expertise of the builder: No metal fasteners are used to connect the frame together, only precision and pegs. The techniques used in timber framing date back thousands of years, and have been used in many parts of the world during various periods such as ancient Japan, Europe, medieval England, the United States and Canada. Timber framing has proven itself as a sustainable and popular building method because of its longevity, simplicity and aesthetic appeal. We use this classic joinery to hand build our structures. Our skills, honed over 20 years, provide unique structures that reflect the natural beauty of the wood, without distraction. Below is an illustrated description of what each of our structures goes through, from timber selection to hand finishing the final piece. We work with the client to determine frame size, embellishments, and any additional modifications which are needed. We hand cut each of the individual elements. Each joint is cut by hand, roughed out initially with simple power tools, and finished up with mallet and chisel. Each connection is tested for precision, and finished elements are set aside to await a final test fit. 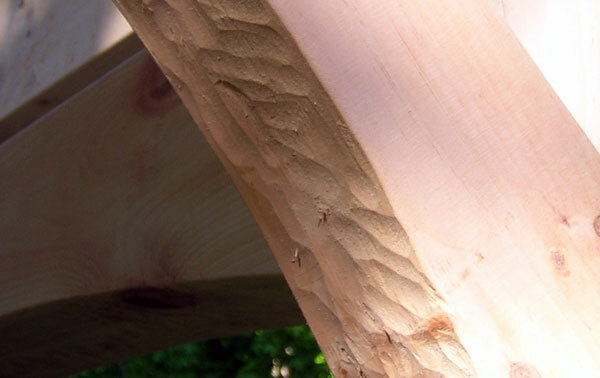 Personalize your timber frame with our hand-gouged braces. These beg to be touched, and people can't keep their hands off of them. We use a classic gouge chisel on each brace, but the pattern is determined by the wood, with grain, knots and species all having a say in the final look. No two braces are ever the same.